Hardly Heroes Game by Seasun for Android/iOS (iPhone/iPad). Hardly Heroes Tip #1: Hero System. Hero Recruiting: You can recruit heroes in the Temple without a daily upper limit. The heroes have different attributes. Higher attribute are more powerful. Hero List: You can check all your heroes in the hero list. You can train, upgrade, add stars and dismiss the heroes in list. Hero Training: Train the heroes to gain experience. Training has a cool down time, you can train a certain amount of heroes at a time. The training time has a upper limit. Hero Upgrade: You can train or spend the experience in the experience pool to upgrade the hero. A higher level hero will have stronger skills. Hero Add Stars: Spend a certain amount of hero shards to add stars to the hero. With more stars, the hero will have better attributes. Hero Dismiss: You can dismiss the heroes. Some of the upgrading experience cost and hero shards will be return to you. Experience Pool: Use hero experience items or dismiss the hero to increase the experience in the experience pool. Hero Marching: You can choose a certain hero to join the battle, the special skill they have will make your army even stronger. 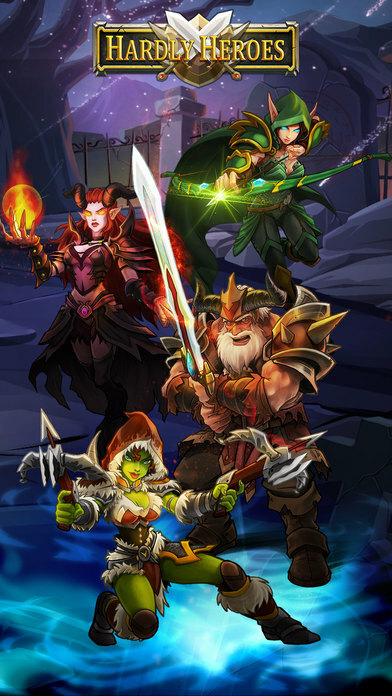 Hardly Heroes Tip #2: Explorers Guild. - You will see different quests in the Explorers Guild, choose different quests to win the rewards you prefer. - According different rewards type, there are different types of quests as well: Resource explorer, Gather Elemental Ore, Gather Purple Ore, Dragon Lair, Ancient Magic and Speedup Magic. - Upgrade the Explorers Guild to get better and richer rewards. The Dragon Lair will available when the Explorers Guild reaches lv.6, and the Gather Elemental Ore/Gather Purple Ore will be available when the Explorers Guild reaches lv.16. Hardly Heroes Tip #3: National Heroes. Hardly Heroes Tip #4: Soldiers Heroes Skills. Hardly Heroes Tip #5: Treating System. Within Treating 10 times at the tavern you are guaranteed a new fighter invitation. If the invited figher is already on your team you will receive the equivalent in rank Glyphs instead. A free treat is available every 48 hours. If you end up treating a merchant instead, there are chances to get gold, exp potions, rank glyphs and even sealed equipment 4 star. Hardly Heroes Gift Code: rewardlikes.